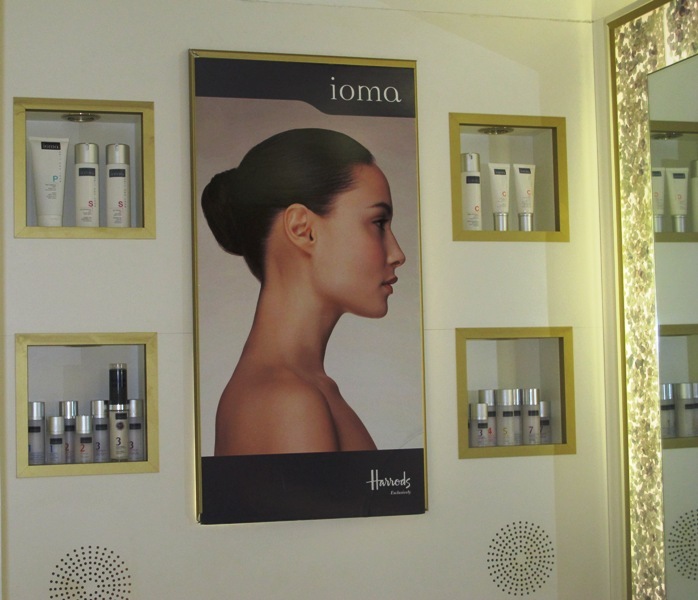 I first came across a beauty brand IOMA PARIS during an anti-ageing show at Olympia, where the products and the team left me feeling intrigued. Then I had another very interesting conversation and diagnostic with the brand’s representative Nikki at Monty’s PR Xmas showcase in the summer ( yes, it happened in July, your read it correctly). My curiosity went up a notch again, especially as I found Nikki not only knowledgable but very calm, in a soothing kind of way. She is one of those people that almost instantly relaxes you when you talk to her. In the middle of October, upon Nikki’s invitation, I came to Harrods brightly lit beauty hall to have an IOMA facial with her. The treatment room, located behind a discreet door at the back of the beauty hall is tiny and you can hear the gentle hum of the shopping crowd outside, yet it doesn’t distract you or the therapist and you feel like you are in a gentle, pampering cocoon. IOMA is a scientific based brand that approaches each of its client’s individually and tailor makes treatments and skincare according to the client’s specific needs. Jean Michel Karam, brand’s founder and CEO took it as one of his main aims to treat his clients in the way that they will see the ‘before’ and ‘after’ results on the computerised screen, after the use of IOMA products. Your skin is assessed by MEMS machine (Micro Electro Mechanical Systems) which detects physical phenomena like pressure, acceleration etc. in a particular environment. In IOMA case MMS are miniaturised and integrated into skin analysis devices that will measure accurately several of skin parameters, like moisturization, clogged pores, bacterial activity, pigmentation, UV damage, redness, fine lines and wrinkles. In the case of bespoke rituals, the formulations will be personalised according to your needs at the moment in time. The machine-IOMA Beauty Diag, Sphere or Link can store your results, making it easy to evaluate the skin’s improvement as you use specific IOMA products. with the readings varying from 1 to 15 and 6-7 being a good reading. Nikki asked me what I expected to get from the treatment and then explained the steps of the facial to me. The facial itself starts with a hot cloth applied to your chest areas and breast bone (soothing and comforting at the same time), followed by the neckline massage which is synchronised to your breathing by the therapist, who is moving her hands with the wide open palm strokes. Nikki throughly removed the make-up not just from my face, but eyes and neckline (ok, no make-up on my neckline but perfume and environmental dirt from living in the city) with IOMA’s gentle moisturising cleansing milk. What made it even more special was that she massaged my eye area, instantly relaxing my whole face and almost sending me into sleepy, dream like state (this is the occasion when I was grateful for the gentle hum of the busy shoppers outside). A moisturising toning lotion then gets applied to cotton wool and spread around your face, with massage like strokes, before a tissue is placed on your face to absorb the extra moisture. Nikki then proceeded with exfoliating my face with a gentle emulsion including the neck area (why don’t more facials include this area, which is often overlooked, yet it is one of the first places to show our age) and relaxing but stimulating eye massage then helps to de-puff and detoxify this delicate area of your face. Each of IOMA facials is tailor-made to your skin’s needs, which the therapist can ascertain visually, as well as based on the machine’s readings. Yes, do bear in mind that certain areas of your face, where the reading might be taken from, might differ from one another-left/right side of your face-for example I think I was born frowning, so clearly I would have more prominent wrinkles around my forehead than around another area of my face. I also asked Nikki about the difference of a few percent between left and right side of the face, and she said that simple facts like on which side of the face you sleep at night can determine the outcome. What makes IOMA facial stand out is the constant, synchronised massage during the facial that also stimulates various points on your face responsible for detoxing, de-puffuing, relaxing, correcting water retention or hormonal balance. It not only stimulates your body but it tones your facial muscles and relaxes you features, as well as your mind. Importance of massage shouldn’t be underestimated, as it’s even been proved that little babies who are massaged and stroked have calmer, happier demeanour. An anti-wrinkle mask was then applied to my face, while Nikki also put moisturising cotton wool pads on my eyes and then proceeded to apply two layers of gauze to my face-I bet looking from the side it looked like a scene from the movie ‘Face-off’ yet felt so cosy and cocoon like. On top of it Nikki applied a warm detoxing mask and while the masks worked their magic, she massaged my scalp and did reflexology, as well as varying massage movements from large to small pinches, percussions, tapping, pressing, flowing or twirling movements-it truly was one of the best, practically non-stop facial massage treatments I ever head, with the soothing sound of waves and arabic motives playing on the sound desk in the background. Add to this the hand and arm massage and you complete upper body gets to be involved in what is technically a facial. With the mask and gauze taken off, as if the imprint of my face for posterity, Nikki expertly treated all of my face to various lotions and potions, like IOMA eye contour cream, ultimate generous serum and generous day cream. Then the measurements, which were taken before the facial get taken again and I have to say that the result, after the non-invasive treatment of just a little over an hour are quite impressive. My face looked more even, with less imperfections and the feeling of softness all over. My eyes were wide opened and the jaw-line relaxed. So if you are looking for a facial that will give you accurate skin diagnostic, as well as personalised product recommendations ( you can also have you day and night cream customised with various serums in order to create a perfectly tailored product for your skin’s needs at the moment in time) and extensive facial massage which will also stimulate your mind and body, then one IOMAs menu of facials is definitely for you. I can go as far as saying that a monthly facial like that would bring your face lasting benefits and delay the ageing process or the need for cosmetic procedures.